In late August I wrote about the Senate race in Kansas, where there was felt to be a real chance of defeating Republican Pat Roberts if the Democratic candidate, Chad Taylor were to drop out. In that situation, polls show that independent Greg Orman has a real chance to beat Roberts. 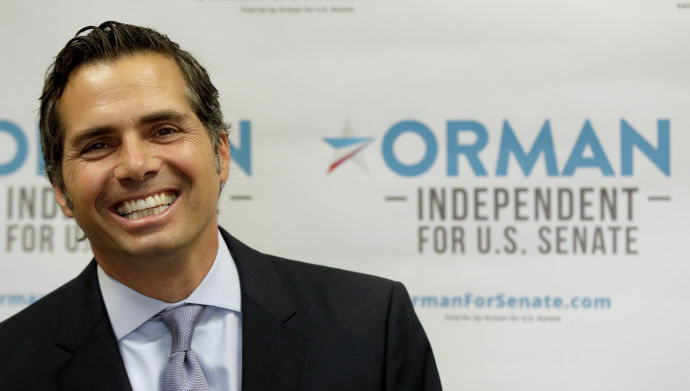 Orman has run as a Democrat in the past, and Democrats hope that he will caucus with them if he wins. Taylor did drop out of the race on Wednesday,increasing the chances that the Democrats can retain control of the Senate. While there has been speculation that the Democrats might be able to beat the incumbent Republican in Georgia or Kentucky, this probably does make Roberts the most vulnerable Republican. One reason that Orman out polls Roberts in a two-way race is that Roberts has run a poor campaign. In response, the national Republican Party now seeks to take control of the Roberts campaign. This further shows that they do feel that Roberts is now vulnerable. Different pundits differ on how much of a difference this will make. Sam Wang now gives the Democrats an 85 percent chance of retaining control of the Senate. Nate Silver been far more pessimistic, and in his model this only increases the chances for the Democrats retaining control from 35 percent to 38 percent. The difference is that Wang has been concentrating more on polls, where Democrats have been out-performing expectations. As polling in these Senate races is of variable quality and number, it is also possible that Silver is correct in discounting them. There remain complications. Earlier in the day The Hill pointed out legal issues which might prevent Taylor’s name from being removed from the ballot. Subsequently Secretary of State Kris Kobach announced on Thursday afternoon that Taylor’s name will remain on the ballot. There is bound to be a legal battle over this. Even if his name remains on the ballot, Taylor’s decision to end his campaign might still result in enough Democratic voters backing Orman to enable him to beat Roberts. Posted in Congress, Democrats, Independents, Politics, Republicans. Tags: Congress, Democrats, Greg Orman, Independents, Republicans. RSS feed for comments on this post.. TrackBack URL. It seems that the Kansas Secretary of State (a Republican, of course) says that Mr. Taylor cannot drop out. He supposedly didn’t complete all his paperwork before the dropout deadline. Ron, you can disregard my earlier comment. What I get for not reading the entire post before hitting the comment link.